Monitor RavenDB and keep it running 24/7, even if it crashes or stops for any reason. 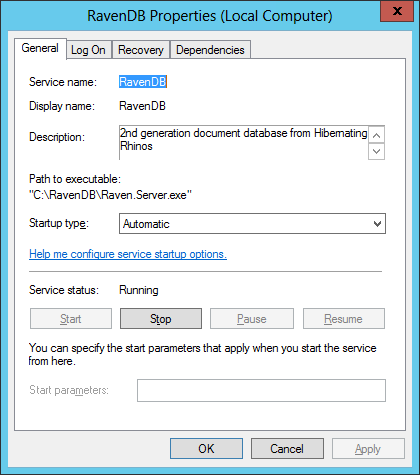 To monitor and automatically restart RavenDB if it stops responding to HTTP requests (or returns a dreaded 5XX/Internal Server error), go to the Monitor tab where we'll set up a failure detection script that Service Protector will use to tell when RavenDB has failed. Follow these instructions to create the failure detection BAT file. We have called ours check-ravendb.bat and saved it in the RavenDB installation folder, C:\RavenDB. 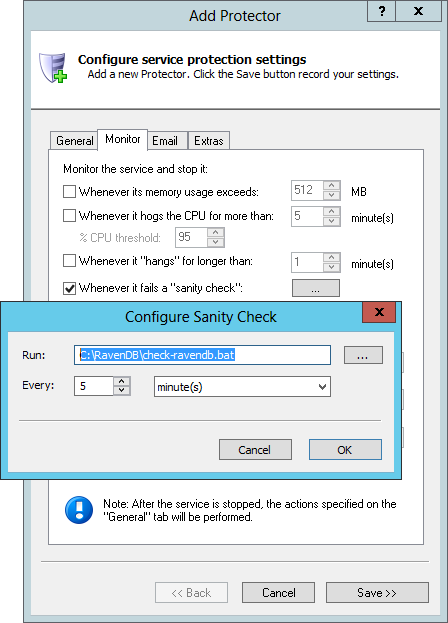 Check the Whenever it fails a "sanity check" box and click the "..." button to open the Configure Sanity Check window. Enter the full path to the batch file you created, enclosing the whole value in quotes if it contains one or more spaces. Change the Every controls to 5 minutes, or however often you wish to check RavenDB's web interface. 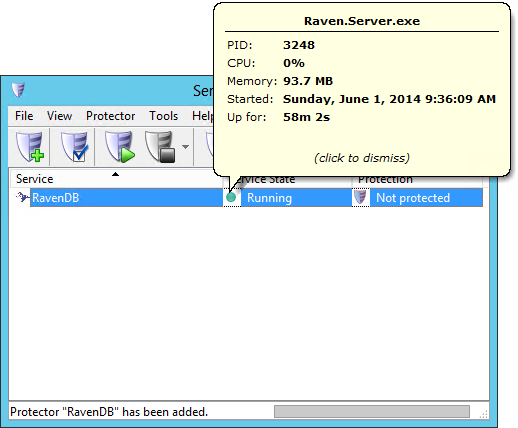 To start protecting RavenDB, choose Protector > Start "RavenDB". The shield icon (which is clickable as well) will go to green to indicate that RavenDB is being actively monitored by Service Protector. That's it! Next time your computer boots, RavenDB will start as normal and Service Protector will begin monitoring the service to quickly restart it if it fails or stops for any reason. 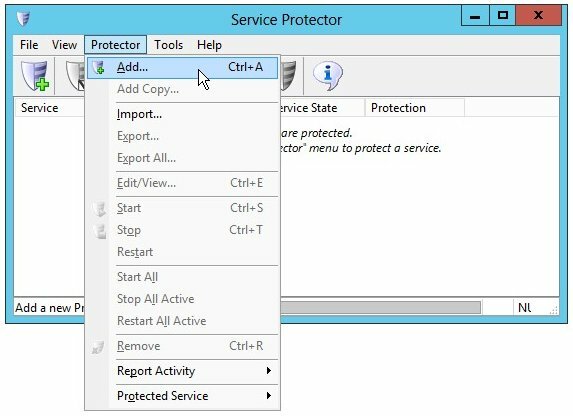 We encourage you to edit RavenDB in Service Protector and check out the many other settings that may be appropriate for your situation. For example, send an email when the service fails, restart RavenDB during the early morning to diminish the effect of memory leaks, etc. 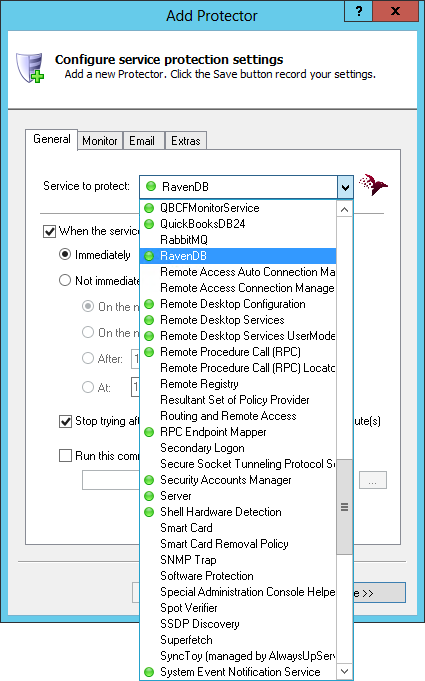 Trouble protecting the RavenDB Windows Service? 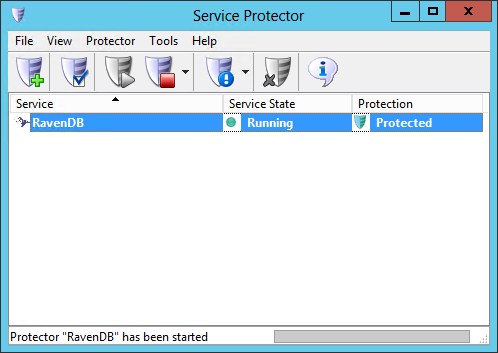 Visit the Service Protector FAQ for answers to commonly asked questions and troubleshooting tips.